This recipe is from the super-Vij of Vancouver fame. He just came out with a new cookbook called Vij’s At Home: Relax, Honey. So tonight dinner featured Spicy Cauliflower Steak and Mung Beans in Coconut Curry. They were a great combo with brown rice as the neutral grounding force but I would put an emphasis on “spicy” in spicy cauliflower steaks. The heat in this recipe builds so hold off on the cayenne if you want it a little more tame. Or just beware of how much sauce you serve up, or serve the dish with a little non-vegan raita on the side. It’s all good. Cut cauliflower, as you would a pie, into 6 pieces if it’s a smaller head and 8 pieces if it’s a larger one. Wash and carefully place large cauliflower pieces in a colander to drain. Combine oil and tomatoes in a large wide pot on medium-high heat. Add ginger, salt, turmeric, cumin, coriander, cayenne, cloves and cinnamon, stir well and saute for 3 to 4 minutes, or until oil glistens from tomatoes. Reduce the heat to low while you mix in cauliflower. Carefully place each large piece of cauliflower into the pot and gently stir so that the tomato masala covers all the pieces. 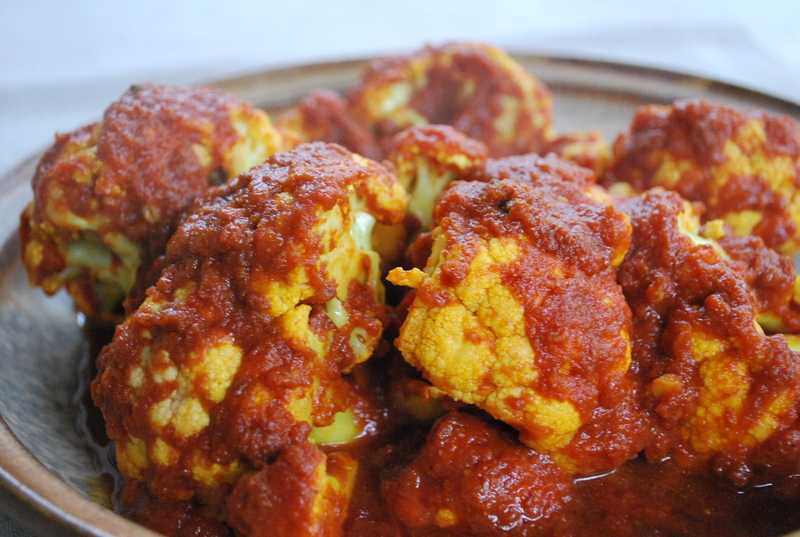 If necessary, use a large spoon to ladle tomato masala into the nooks and crannies of the cauliflower pieces. Increase the heat to medium, cover and cook for 8 to 10 minutes, stirring once halfway through. When you stir, if you notice that the cauliflower isn’t cooking, increase the heat. If it’s sticking to the bottom of the pot, decrease the heat. Pierce one of the larger pieces with a knife to see if it is soft. if necessary, cook cauliflower, covered, for another 1 to 2 minutes.